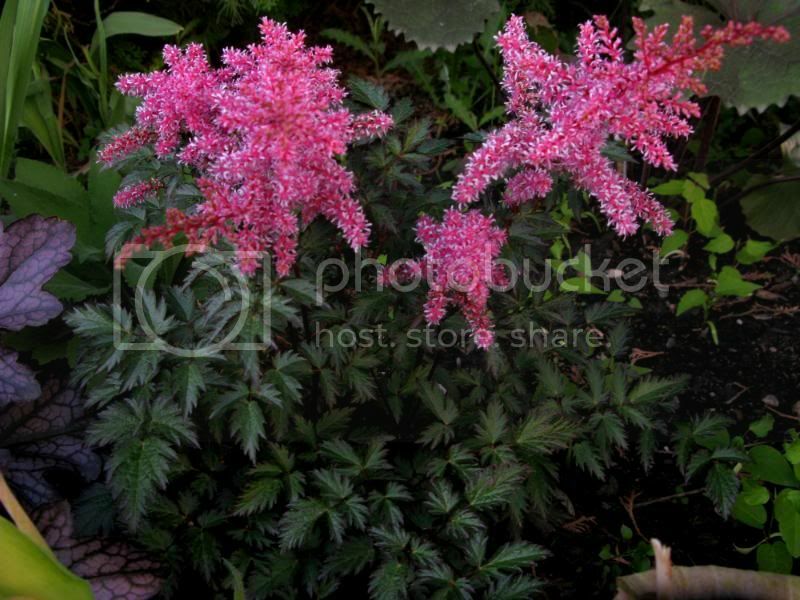 The Astilbe,I have 6 of them in different shades,here are 3...easy to grow,nice foliage after it finish blooming! Some of my Daisies,I think they are really beautiful in their simplicity. Here is this succulent plant(don't know what they are called)I planted just to hide a spot and now I really love it,it cannot be killed. I love the astilbe. I need to get some of those. I am looking for a nice flowering plant that doesn't mind somewhat semi shady conditions and it is my understanding that Astilbe don't need a lot of sun. I'm not sure but I think the succulent is sometimes known as "hens and chickens." If that's the one, I have to admit I had one a few years ago and I managed to kill it. I have a grove of oaks out back that we are no longer mowing under. I threw in some ferns and hostas last year and they're doing great! Thought I'd try some color, so I'm thinking of putting in some astilbe, too. Do you know if they're deer resistant, chico? They really are pretty!!! Our front yard is a Shasta daisy field--pretty, but oh-so-invasive. Still, it's very pretty when they're all in bloom--I'll have some pics soon that I'll post elsewhere. I planted 2 Astilbes this year, and am really enjoying them! 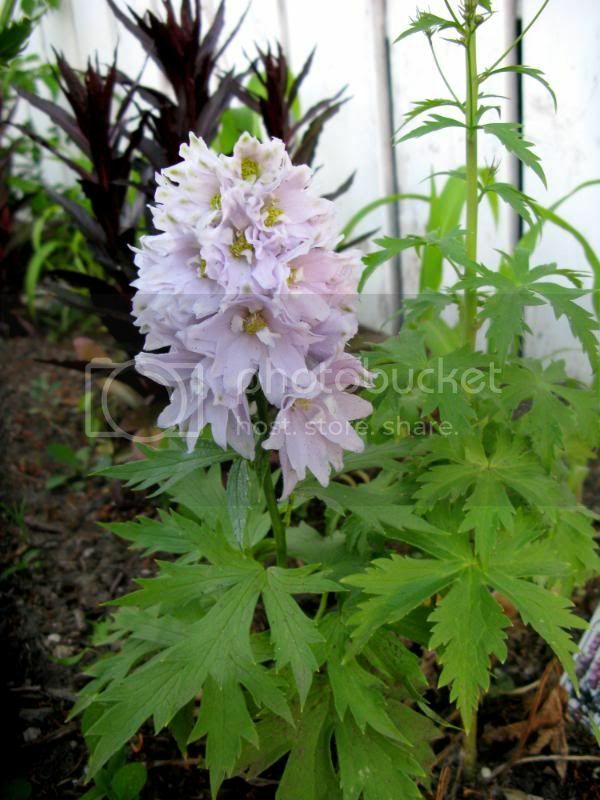 My favorite perennial is the Delphinium! I have 10 different colors. Photo's of the delphiniums, please, Myka, I love them too. Here they have to be treated as annuals though, I rarely have them survive till the next year. The Astilbe is very nice, Chico, such a soft pink, and any daisy is okay by me. They aren't fully open yet! Half of them I just planted this year too, so they won't be very impressive until next year. In my area which is zone 2/3 the Delphiniums grow really well. The ones I planted last year are huge this year with 3/4" stalks! I can't believe how well they have done. I'm just new to the area having come from zone 5/6, and didn't know Delphiniums could get so big so fast!! They really enjoy the cooler weather. I'll go see what I can get for pics, but I think only 2 of them have any flowers open yet. Magnificent photo's, Myka. That rose is a stunner, the tulip is a wonderful rich colour, Ive put an order in for a Bleeding Heart after you and others have shown me how beautiful they are, and don't the blue delphiniums look great against that fence. I love your double lilac one, I don't think I have had that one. Mine here is a double lilac but hasn't the same shaped petals. I'm in Zone 9 incidentally. Ooooh, nice Irises too! I have a "black" one that is gorgeous, but it is already over. It doesn't last long, only about 10 days. 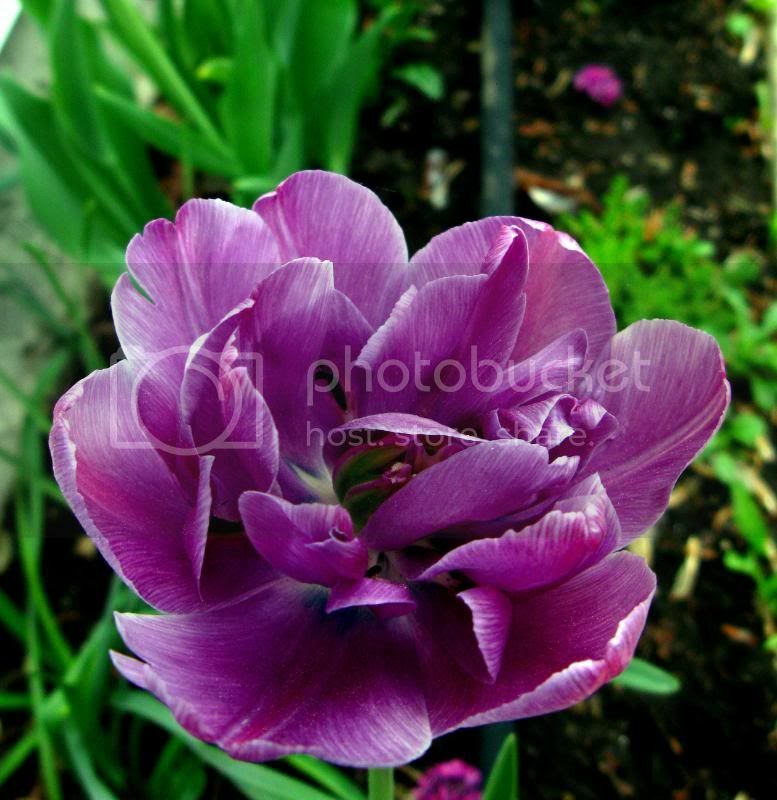 I love bulbs, I planted about 300 last year. Hehehe...addiction? We are in a new (to us) home so I just started planting the gardens last year. You should have lots of photo's to show us with that many bulbs, Myka, fantastic. I didn't even notice the black eye, thanks for pointing that out. There is a place in New Zealand that grow some 'to die for' delphiniums, all colours, but it's seed they sell and I have no luck with that. Did you grow yours from seed? I wish that even the plants were as robust as Larkspurs, they self sow easily. Sometimes I do wonder why I grow Dutch and Bearded Irises. They are superb, but I agree, so short lived. Doesn't stop me from buying more each season, I must be a slow learner. LOL. chico...I love your flowers they are so pretty. 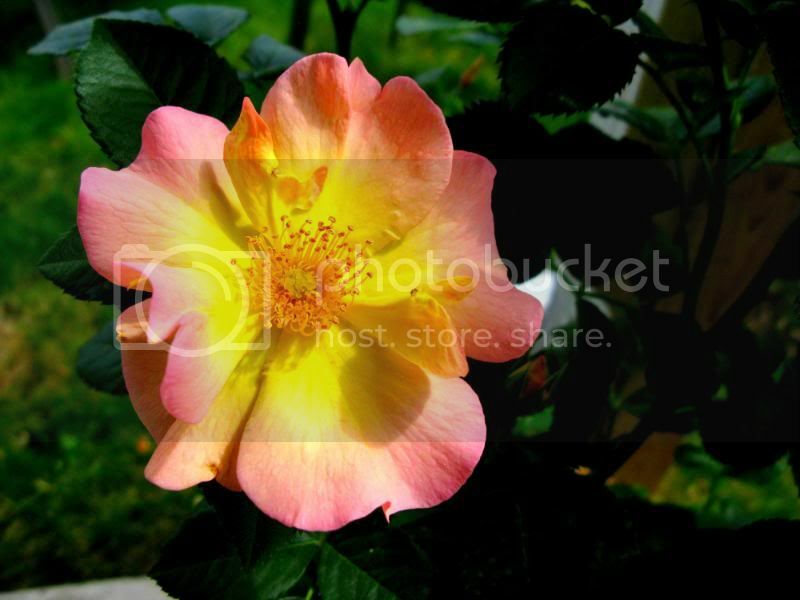 I have one astible too, but it a reddish colour,,,it was suppose to be pink. chico, it turns out one of the local nurseries is having a clearance on their astilbes (and some of their other perennials) this weekend--do you know if you can transplant astilbes in the heat, or would it be better to leave them in the pot and transplant when they're done blooming and it's cooler? Astilbes like shade so I'm figuring they probably won't like this heat? Hazel,all of mine get plenty of sunshine,but also shade,I am sure you can plant it right now. The last one I bought is red,almost blooming now,I took it right out of the pot last year even thogh it was in bloom and no harm done. Hazel, from what I have read astilbe likes lots of water and the soil should never be allowed to dry out. As long as you make sure you keep it well watered till it becomes established it should be fine. I'm going to see if I can find some too. Easy to grow eh Chico2? I planted Astilbe a couple years ago and can't find it anymore! I think I need to ease back on planting so many things in limited space. I love the very first picture in the first post. It looks so fluffy! Don't feel bad KLM. Same thing happened to me about 20 years ago. Bought an astilbe one year and it seemed to be doing fine. Then it disappeared. Never tried it again. Now that I am more experienced (only kill half as many plants as I used to) I'm going to give it another try. 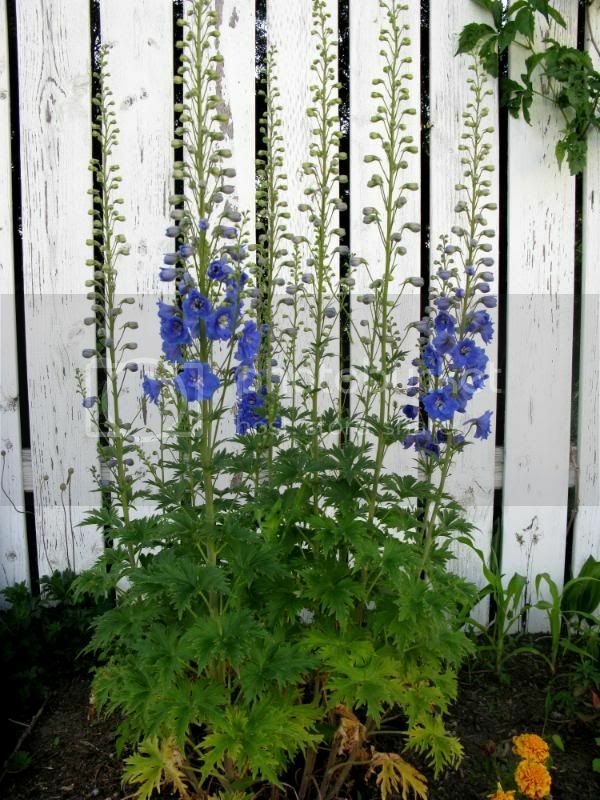 I love delphiniums, especially the blue and white ones. I would love to have a huge border of those next year. Chico - your gardens are as beautiful as always. And yes, your succulent is Hensandchickens. 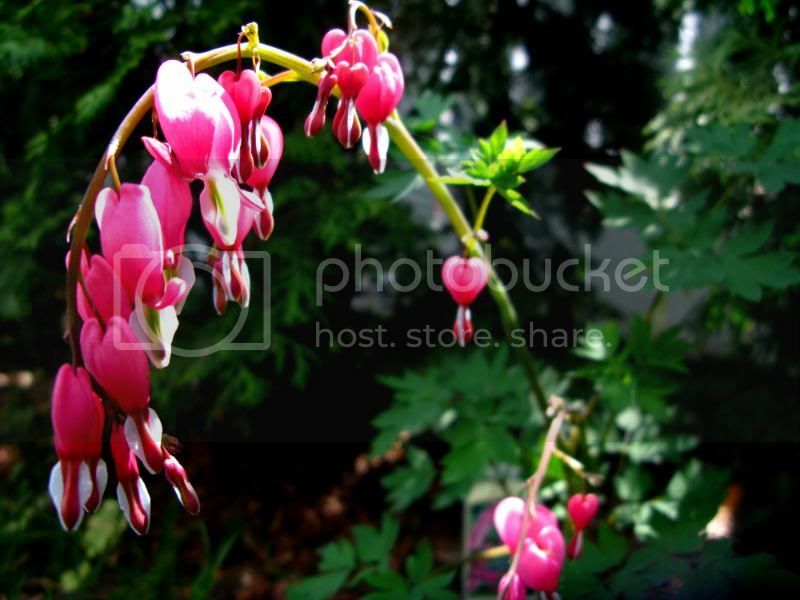 When you see the flower, or the long phallic looking part of the plant, that means that plant will now die. No worries. It is replaced quickly with new babies. beautiful chico, I have astilbes also, don't you find they take over your garden??? I've been pulling them out when they get to be too many and now I have them jumping the border into the grass , how do you keep them contained? is there a secret? I love your gardens!!!! Oh, an added benefit! Maybe something I can't kill! Melinda,mine are kind of tight,not to much room for them to spread,but they certainly grew taller this year. I have a large white one in the back,on one side it has a red Hibiscus and on the other Lavender,not much room to move ..
Gerri I am glad the chicks and hens will not die,it's been so abused,we've stepped on it,the cats have sprayed it,but it's still growing every year. It's kind of cute the way little ones grow all around it.. Unlike so many here,I have kind of limited space,so it's a little cramped in my garden.